S-9300 Bond-Kote Gray and S-9302 Bond-Kote White are the ultimate concrete repair, resurfacing and texturing product all-in-one! 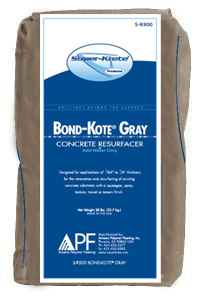 Bond-Kote virtually eliminates the need to remove and replace old, damaged concrete. It is a ready-mix formula. Just add water! Use Bond-Kote for crack treatments, curb and gutter repair, sidewalk resurfacing, driveway resurfacing and anywhere else there is concrete! Now you can texture Bond-Kote at 1/8”" thickness directly over properly prepared concrete substrates, and texture it to create the look of slate, stone, tile, brick or wood. This multi-use product has an extended pot life of several hours. Bond-Kote was also the product used to create the famous pirate ship in Disney’s movie: “Pirates of the Caribbean: Dead Man’s Chest. The ship creators applied Bond-Kote directly over an existing 175 foot steel ship, and were impressed by its flexibility, its resistance to damage or deterioration after being submerged in salt water during the two year filming period of the movie, and their ability to easily create the appearance of aged wood with it. Apply by squeegee, gauge rake with 1/8"” cams, trowel, sprayer, brush or broom. Coverages are approximations only. Actual coverage will vary depending on substrate conditions, application method and weather. 300 sq. ft. per bag @ 1/32"
50 sq. ft. per bag @ 1/8"